"A soil test is like an X-ray sheet," says R S Mehla, joint director of Haryana's State Soil and Water Testing Laboratory, Karnal. The test results give a detailed picture of the condition of the soil and its characteristics. "The objective of soil testing is to help farmers make judicious use of fertilisers and thereby lower costs and increase productivity, as every soil needs different nutrients," Mehla says. There are 13 basic nutrients. Carbon, hydrogen and oxygen, the primary elements, are available from air and water. The secondary elements -- nitrogen, phosphorous and potassium, are available as fertilisers. Only limited quantities of the 7 remaining elements -- iron, zinc, copper, sulphur, magnesium, manganese and molybdenum -- are needed. However, a deficiency in any of these nutrients can drastically reduce yield. Every state, except Himachal Pradesh and those of the Northeast, has a soil testing laboratory under its department of agriculture. Most agricultural universities in the country also test soil and government laboratories provide this service free of cost to farmers. The benefits of this service can be startling. Mehla says that soil tests revealed that south Haryana was deficient in sulphur, an essential ingredient for oilseeds, its chief crop. Farmers were advised by the state laboratory in Karnal to use gypsum from Rajasthan as it contains 20 per cent sulphur and, with the 90 per cent subsidy given by the government, it cost as little as Rs 4 a bag. Thanks to this single measure, Haryana's per hectare oilseeds productivity is the highest in India. The state has 27 laboratories which test an aggregate of 11,000 individual samples every year. The Haryana Agricultural University in Hissar manages 3 laboratories. In addition, 2,500 soil samples are collected from a general survey by the laboratories' agricultural extension workers. The extension workers then convey the results of the soil check to the farmers and explain the recommendations. Since water use is equally important for the health of the soil, state-run labs check the quality of water and its effect on the soil. 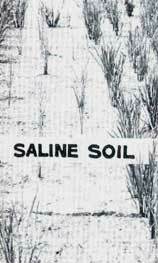 Farmers can destroy soil compositions by using highly saline water or by overuse of fertilisers. Haryana's State Soil and Water Testing Laboratory in Karnal has also prepared an extensive soil fertility map of the state. Problem areas have thus been delineated; poor quality soil can be treated and reclaimed for cultivation. The National Bureau of Soil Survey and Land Use Planning conducts research in soil genesis, its correlation and classification. The bureau's headquarters are situated in Nagpur and it has regional centres in Calcutta, Bangalore, New Delhi, Jorhat and Vadodara. Says P C Rana, chief scientist of the Bureau in New Delhi, "The Institute is currently engaged in conducting an extensive soil survey on an all-India basis and in preparing a soil map of the country and marking the problem areas." The interpretation of soil maps for alternative land use plans, evaluating the carrying capacity of different soil units and dealing with taxonomic problems, and predicting potential soil problems such as salinity and waterlogging are part of its agenda.